“A kind of peasants’ revolt”. So said Boris Johnson of the European election results on Monday in a – typically English – evaluation of the events. Yet the picture is much more nuanced – and varied – than he makes out. Right and left wing populists are not triumphant everywhere. Other fringe parties have performed remarkably well too. And most importantly, the EU is only part of the story – national mainstream politicians need to take their fair share of responsibility for the results today. If capturing the political mood of a nation into a coherent narrative is always difficult, doing so across 28 different countries is a colossal challenge. So it’s hardly surprising that many have come to the conclusion that the story of this election is a populist revolt. But has there truly been a populist surge at the elections? Analysing the results suggests that a number of parties that could fairly be described as populists have done remarkably well. The Front National (FN) was victorious in France’s European elections. So were UKIP and the Danish People’s Party in the UK and Denmark. Despite a good performance by Renzi’s PD in Italy, there’s no escaping that the Five Star Movement won over 20 per cent of the vote. The newly formed Alternative for Germany party gained its first seats. 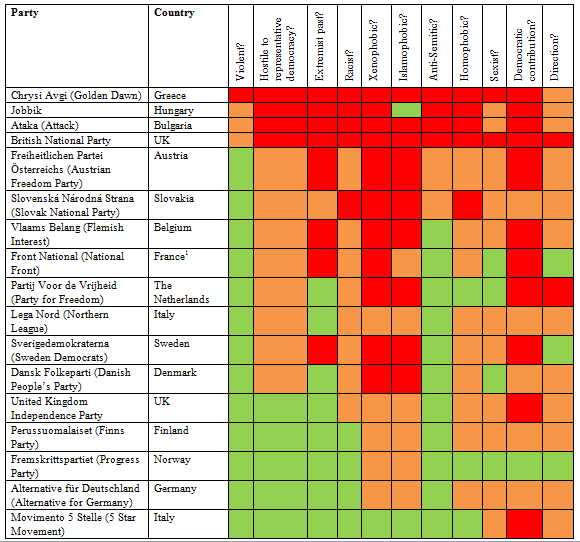 No doubt all these parties are very diverse and not all are as problematic as each other – Counterpoint’s matrix of populist parties, released last week, charts many of these differences. But they all put in strong performances on Sunday. Yet other populist parties performed less well. Despite all his bluster, Geert Wilders’ PVV fell by 4 per cent compared to its score in 2009, cementing the party’s downward trajectory after its poor showing in the Dutch parliamentary elections in 2012. Flemish regionalist party Vlaams Belang had a bad night and was close to losing all of its MEPs. The Finns Party won an extra seat but still under-performed compared to expectations. Lega Nord lost nearly half its seats. The Slovak National Party and Ataka have both now lost all representation in the Parliament. So the picture is a mixed one. Still, because France, the UK, Italy and Germany are big countries with lots of MEPs, strong results by populists here mean that there will be a significant increase in their numbers in the European Parliament. In policy terms, as we argued last year, populist MEPs will have little influence in the new Parliament, which will continue to be dominated by centrist parties. Populist parties will struggle to work together, are likely to be split across a number of political groups, and will be marginalised by the mainstream MEPs. On the other hand, in political terms, there is no doubt that they will be disruptive — they will do their best to derail plenary debates, they will hamper the functioning of the institution, and they will possibly, in the context of an elected President of the Commission who will be more constrained by the EP’s functioning (or disfunctioning), push politicians and policy-makers to increasingly bypass what may be an even more inefficient Parliament. Their capacity to create even more unaccountability through inter-governmentalism should not be under-estimated. So does the surge of Eurosceptic populist parties in some countries represent a rejection of the current direction of the European Union? To a degree, it does, and it would be complacent to deny it. But national governments must also take responsibility for the rise. In France, disillusionment with President Hollande spurred FN voters on (and made socialist voters stay home); in the UK, UKIP support is in part a response to general political frustration, unpopularity with the coalition and a lacklustre Labour party. And so on for other countries. European elections have always been considered “second-order” elections, treated by voters as a way of sending a message to the current government. National politics still dominate. To blame the rise of these parties on the EU may seem like a smart tactic for national politicians wanting to absolve themselves of responsibility. But it’s neither fair nor in their long-term interests. In fact, the actual story of these elections is bigger than the partial surge of populism. Two key trends stand out. First, stagnating voter turnout: the simple fact is that, despite the effort of the Spitzenkandidaten, many voters just weren’t bothered by these elections. This affected not only mainstream parties but also populists: Geert Wilders confessed that his voters in the Netherlands hadn’t turned out to support his vision of a demolished EU. In many cases both supporters and critics of the European Union didn’t care enough to make their voices heard. The other story is not of a populist revolt, but of a popular revolt. The leftist Syriza (sometimes misleadingly described as Eurosceptic) in Greece, the Greens and the Feminist Initiative in Sweden, the liberal NEOS in Austria, the ANO movement led by businessman Andrej Babiš in the Czech Republic, and a number of small parties (including the anti-austerity Podemos, connected to the Indignados movement) in Spain. All of these are popular revolts against specific sets of policies that are seen as going directly against the interests of particular groups. They are not populist because, unlike the FN, they are not about the wholesale rejection of all political elites in power, but about the rejection of specific interests and the lack of representation of others. For those who have joined in a popular revolt, such as the Syriza voters, the motivation is to hold the old parties accountable, but it is above all to change the terms of the European bargain. This clear trend of growing political fragmentation across Europe means that the total share of the vote for the centrist Social and Christian Democrat (and Conservative) parties has declined. The ties to these old parties are loosening. No doubt European politics is changing. Some of this is down to a revolt against the EU. But in other cases it isn’t. In both the populist and the popular revolt there is a rejection of politics as usual: for those who support the populist parties, this is less about policies and more about the nature of engagement. For many who voted for the FN or for UKIP, the disgruntlement is in great part fuelled by the loss of control they feel. The fantasy of regaining sovereignty by leaving Europe mirrors all sorts of fantasies about feeling politically powerless on an individual level – discarded as workers, left out as citizens, talked down to as a group, forgotten by the cosmopolitan politics of the early 21st century. UKIP and the FN create the illusion that this can all be remedied. But the lessons that mainstream parties need to learn are very real: open up, listen up, smarten up, or else. Not purely in policy terms, but in the nature of their political engagement with voters. Boris Johnson is right to note the heterogeneity of the parties that have performed well in this election. But he is wrong to imply they have similar goals. The true story of these elections is not a Eurosceptic revolt. It is a story of a continent that is at once electorally disengaged and increasingly politically diverse. This piece has also appeared on the Counterpoint website. Marley Morris is a researcher and consultant at Counterpoint on the Recapturing Europe’s Reluctant Radicals project. Marley focuses on populist parties and movements, political narratives, and the social and cultural determinants of instability in Europe. This entry was posted in Austria, Czech Republic, Europe, European elections, Euroscepticism, France, Greece, Italy, Nationalism, Spain, The Netherlands, United Kingdom and tagged European Elections 2014, European Union, Euroscepticism, populism. Bookmark the permalink.